For the writer and producer of Technotronic, see Jo Bogaert. De Quincey was born at 86 Cross Street, Manchester, Lancashire. His father was a successful merchant with an interest in literature who died when he was quite young. Soon after his birth the family went to The Farm and then later to Greenheys, a larger country house in Chorlton-on-Medlock near Manchester. In 1796, three years after the death of his father, Thomas Quincey, his mother – the erstwhile Elizabeth Penson – took the name "De Quincey." In the same year, De Quincey's mother moved to Bath, Somerset, and enrolled him at King Edward's School. 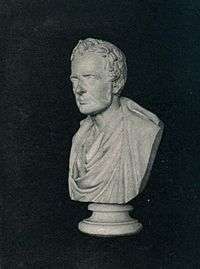 Bust of Thomas De Quincey, by Sir John Steell. Discovered by chance by his friends, De Quincey was brought home and finally allowed to go to Worcester College, Oxford, on a reduced income. Here, we are told, "he came to be looked upon as a strange being who associated with no one." In 1804, while at Oxford, he began the occasional use of opium. He completed his studies, but failed to take the oral examination leading to a degree; he left the university without graduating. He became an acquaintance of Coleridge and Wordsworth, having already sought out Charles Lamb in London. His acquaintance with Wordsworth led to his settling in 1809 at Grasmere, in the Lake District. 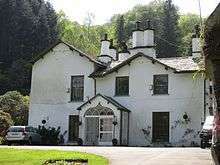 He lived for ten years in Dove Cottage, which Wordsworth had occupied and which is now a popular tourist attraction, and for another five years at Fox Ghyll near Rydal. De Quincey was married in 1816, and soon after, having no money left, he took up literary work in earnest. 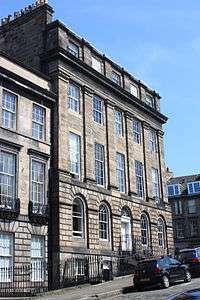 De Quincey's large house at 1 Forres Street, Edinburgh. In July 1818 De Quincey became editor of The Westmorland Gazette, a Tory newspaper published in Kendal, after its first editor had been dismissed. He was unreliable at meeting deadlines, and in June 1819 the proprietors complained about "their dissatisfaction with the lack of 'regular communication between the Editor and the Printer'", and he resigned in November 1819. De Quincey's political sympathies tended towards the right. He was "a champion of aristocratic privilege," reserved "Jacobin" as his highest term of opprobrium, held reactionary views on the Peterloo Massacre and the Sepoy rebellion, on Catholic Emancipation and the enfranchisement of the common people, and yet was also a staunch abolitionist on the issue of slavery. 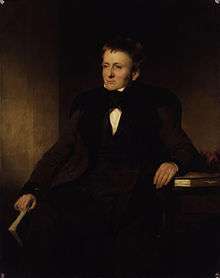 Thomas De Quincey, by George Hamlin Fitch. 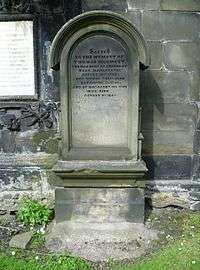 De Quincey's grave in St. Cuthbert's Kirkyard, Edinburgh. Both of these were multi-volume collections, yet made no pretense to be complete. Scholar and editor David Masson attempted a more definitive collection: The Works of Thomas De Quincey appeared in fourteen volumes in 1889 and 1890. Yet De Quincey's writings were so voluminous and widely dispersed that further collections followed: two volumes of The Uncollected Writings (1890), and two volumes of Posthumous Works (1891–93). De Quincey's 1803 diary was published in 1927. Yet another volume, New Essays by De Quincey, appeared in 1966. His immediate influence extended to Edgar Allan Poe, Fitz Hugh Ludlow, Charles Baudelaire and Nikolai Gogol, but even major 20th-century writers such as Jorge Luis Borges admired and claimed to be partly influenced by his work. Berlioz also loosely based his Symphonie fantastique on Confessions of an English Opium-Eater, drawing on the theme of the internal struggle with one's self. ↑ de quincey. Dictionary.com. Collins English Dictionary – Complete & Unabridged 10th Edition. HarperCollins Publishers. http://dictionary.reference.com/browse/de_quincey (accessed: 29 June 2013). ↑ Lindop, Grevel The Opium-Eater: A Life of Thomas De Quincey, London, J. M. Dent & Sons, 1981. ↑ The later building on the site (adjoining John Dalton Street) bears a stone inscription referring to de Quincey. ↑ Eaton, pp. 1–40; Lindop, pp. 2–43. ↑ Lindop, pp. 25, 46–62 and ff. ↑ "Nomination for the English Lake District Cultural Landscape: An Evolving Masterpiece" (PDF) (PDF). Lake District National Park Partnership. 20 May 2015. p. 39. Retrieved 23 May 2016. ↑ "Death of Colonel de Quincey". The New Zealand Herald. XXXI (9486). 16 April 1894. p. 5. Retrieved 10 December 2013. ↑ Liukkonen, Petri. "Thomas De Quincey". Books and Writers (kirjasto.sci.fi). Finland: Kuusankoski Public Library. Archived from the original on 10 February 2015. ↑ Purdon, James (6 December 2009). "The English Opium Eater by Robert Morrison". The Guardian. London. ↑ Eaton, pp. 309–33 and ff. ↑ Thomas De Quincey, Recollections of the Lakes and the Lake Poets, David Wright, ed., New York, Penguin Books, 1970. ↑ Lindop, pp. 246, 255, 257, 269, 271 and ff., especially 319-39. ↑ Lindop, pp. 310–11; Eaton, pp. 342–3. ↑ "A Parliament for a People...." (PDF). Retrieved 25 September 2011. ↑ C. H. Hendricks, cited in: Judson S. Lyon, Thomas De Quincey, New York, Twayne Publishers, 1969; p. 57. ↑ George M. Gould, cited in Lyon, p. 55. ↑ Philip Sandblom, Creativity and Disease, Seventh Edition, New York, Marion Boyars, 1992; p. 49. ↑ Alethea Hayter, Opium and the Romantic Imagination, revised edition, Wellingborough, Northamptonshire, Crucible, 1988; pp. 229–31. Abrams, M.H. (1971). Natural Supernaturalism: Tradition and Revolution in Romantic Literature. New York: Norton. Agnew, Lois Peters (2012). Thomas De Quincey: British Rhetoric's Romantic Turn. Carbondale: Southern Illinois University Press. Barrell, John (1991). The Infection of Thomas De Quincey. New Have: Yale University Press. Bate, Jonathan (1993). "The Literature of Power: Coleridge and De Quincey." In: Coleridge’s Visionary Languages. Bury St. Edmonds: Brewer, pp. 137–50. Baxter, Edmund (1990). De Quincey's Art of Autobiography. Edinburgh: Edinburgh University Press. Berridge, Virginia and Griffith Edwards (1981). Opium and the People: Opiate Use in Nineteenth-century England. London: Allen Lane. Clej, Alina (1995). A Genealogy of the Modern Self: Thomas De Quincey and the Intoxication of Writing. Stanford: Stanford University Press. De Luca, V.A. (1980). Thomas De Quincey: The Prose of Vision. Toronto: University of Toronto Press. Devlin, D.D. (1983). De Quincey, Wordsworth and the Art of Prose. London: Macmillan. Goldman, Albert (1965). The Mine and the Mint: Sources for the Writings of Thomas De Quincey. Carbondale: Southern Illinois University Press. Le Gallienne, Richard (1898). "Introduction." In: The Opium Eater and Essays. London: Ward, Lock & Co., pp. vii–xxv. McDonagh, Josephine (1994). De Quincey's Disciplines. Oxford: Clarendon Press. North, Julian (1997). De Quincey Reviewed: Thomas De Quincey’s Critical Reception, 1821-1994. London: Camden House. Oliphant, Margaret (1877). "The Opium-Eater," Blackwood's Magazine, Vol. 122, pp. 717–41. Roberts, Daniel S. (2000). Reviosionary Gleam: De Quincey, Coleridge and the High Romantic Argument. Liverpool: Liverpool University Press. Russett, Margaret (1997). De Quincey’s Romanticism: Canonical Minority and the Forms of Transmission. Cambridge: Cambridge University Press. Rzepka, Charles (1995). Sacramental Commodities: Gift, Text and the Sublime in De Quincey. Amherst: University of Massachusetts Press. Saintsbury, George (1923). "De Quincey." In: The Collected Essays and Papers, Vol. 1. London: Dent, pp. 210–38. Snyder, Robert Lance, ed. (1985). Thomas De Quincey: Bicentenary Studies. Norman: University of Oklahoma Press. Stephen, Leslie (1869). "The Decay of Murder," The Cornhill Magazine, Vol. 20, pp. 722–33. Stirling, James Hutchison (1867). "De Quincey and Coleridge Upon Kant," Fortnightly Review, Vol. 8, pp. 377–97. Wellek, René (1944). "De Quincey’s Status in the History of Ideas,” Philological Quarterly, Vol. 23, pp. 248–72. Woodhouse, Richard (1885). "Notes of Conversation with Thomas De Quincey." In: Confessions of an English Opium-Eater. London: Kegan Paul, pp. 191–233. 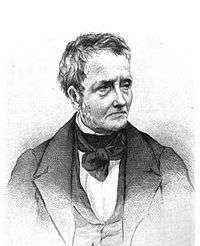 Wikimedia Commons has media related to Thomas de Quincey. Wikisource has the text of the 1911 Encyclopædia Britannica article De Quincey, Thomas.